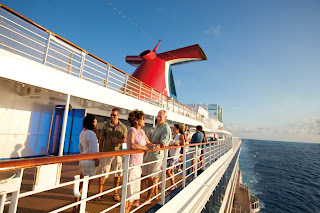 When I think of a cruise vacation aboard a Carnival cruise ship “fun” is what comes to mind! So how can the addition of Bonsai Teppanyaki on the new Carnival Horizon be anything other than a perfect fit? 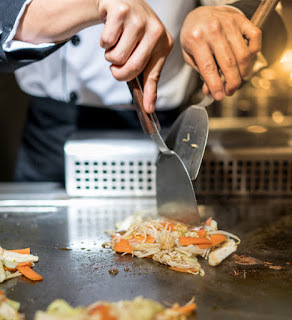 Teppanyaki refers to Japanese dishes that are typically prepared using a large, flat iron griddle. With this unique entertaining dining style, chefs have all utensils and ingredients lined on the borders of the grill and cook several dishes in front of diners with stunning flair and speed. The chef’s performance generally includes juggling food with spatulas and building steaming volcanoes out of tower of cooking onions! There are a variety of entrees to choose from such as lobster tail with yuzu cream and citrus kosho, filet mignon with truffle salt, garlic chips and champagne-cognac flambé, teriyaki salmon with savory and sweet teriyaki glaze and black cod with soy reduction. Further choices include shrimp with young lettuce and gyukuro tea, shichimi spiced grilled chicken with teriyaki sauce and grilled tofu with vegetables, yaki udon and teriyaki anticucho sauce. Four combination dinners are available, including filet mignon/shrimp, shrimp/spiced grilled chicken, filet mignon/teriyaki salmon, and filet mignon/lobster tail. All dishes include fried rice and stir-fried vegetables. Meals end on a sweet note with a chocolate bento box with green tea ice cream. There is an additional cost to dine at Bonsai Teppanyaki. The restaurant will be open for lunch on sea days and for dinner every night of the cruise. If you'd like to try Teppanyaki, the Carnival Horizon will sail out of New York City from May through September 2018 before moving to the port of Miami.